Status: Paired with an un-ringed bird in East Anglia since Spring 2015. 2016: One nesting attempt but failed at egg stage. 2017: No nesting attempt recorded this year. 2018: Bred with unringed partner incubating one egg which failed to hatch. June 2011: Beatrice came from a really short, fat egg and has no sibling. She has turned into quite a dominant, big chunky bird but is not aggressive at all - even though she would probably win any confrontation. August 2011: Beatrice has suffered from a bit of a limp this month as she untypically got into a little brawl with another bird. She is now improving and her aggression has subsided. Due to her having a sore leg, she often stays by herself as she didn’t want to walk much, but has started integrating with the group again. 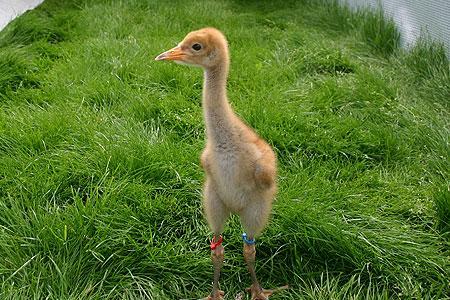 October 2011: Beatrice is now a well integrated member of the flock of 1st year and juvenile cranes that are regularly being seen out and about foraging on crane-flies and on stubbles and at supplementary feeding points. 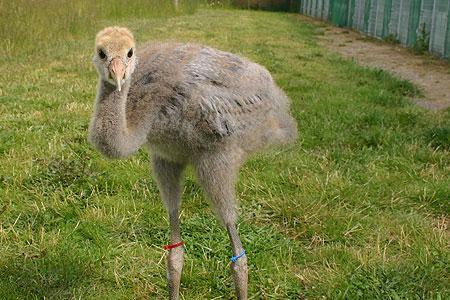 September 2012: Beatrice was one of a group of birds that flew to Slimbridge in May, and remained for 19 days before returning in early June. Beatrice has largely adapted well to life with the Somerset flock and she and her cohort are all behaving as naturally as any wild cranes. They have spent the summer feeding on the un-seasonally flooded grasslands of the Moors and Levels in small fragmented groups, but as autumn rolls in they are starting to flock again and follow the harvest, hoovering up any spilt and wasted grain in the fields. January 2014: 2013 was largely uneventful for Beatrice, although she spent 8 days at Slimbridge again in the early part of the spring. The rest of the spring and summer were spent on Aller Moor and West Sedgemoor and the winter very much as part of a tight-knit flock on Stanmoor, near Stoke-St.Gregory. We hope that she will pair up this year, although at 3 years old he is still very young to make a breeding attempt. July 2015: Beatrice remained in Somerset through the spring and summer of 2014 but went missing for 3 months around the time of moult – and we assume that she was moulting quietly down on the Levels and Moors. The winter of 2014/15 she also remained in Somerset with the main flock. 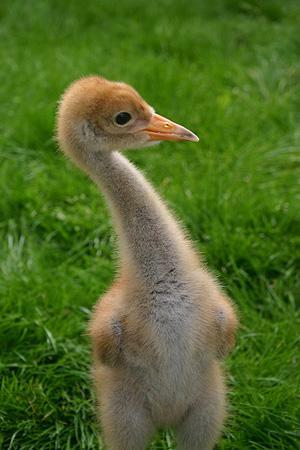 However – in April 2015 Beatrice joined the group at Slimbridge and then in May she disappeared but was then sighted near Thrapston with another unidentified bird and then in Northamptonshire before turning up at the Ouse Washes in Cambridgeshire in the company of an unringed crane. February 2016:She was seen on an off through the summer around the Ouse Washes and near Ely. Initially this was with a group of five cranes - but she then appeared to pair up with a single bird, with whom she was seen mating in October. She remained in East Anglia through the winter and paired with this unringed individual. It seems likely that she may now remain and make a breeding attempt in the Cambridgeshire Fens in 2016. July 16: Remained in last year’s territory, the Ouse Washes. Incubation started on the last day of March and failed about half way through the incubation period. There have been no further observations of this pair reported. Nov 17: Beatrice has been seen with an unringed bird in Cambridgeshire throughout the winter and again this Spring, but this year she is not thought to have nested. Beatrice has been seen with wild cranes in this area in recent months. Sept18: Beatrice was reported present in Cambridge Fens in the Spring where she bred with fenland male, sitting from at least 19th May on a single egg but abandoned it around 18/19 June . – (so possibly it was infertile? / failed to hatch).